Yet another classic manoeuvre the pinch vanish can be done as a trick itself, but more commonly it is used as a sleight of hand move in a larger trick. The magician holds up a coin for display with one hand in full view of the audience. With his other hand the magician takes the coin and then rubs his fingers together. When the fingers open, the coin is gone! The sleight of hand move called the pinch vanish retains the coin in the starting hand. No extra materials are needed beyond a coin. The Pinch Vanish, also called the Drop Vanish, is used to fool the audience into thinking that the magician has taken the coin - or similar small object - away in his right hand while actually retaining it in his left. The magician holds a coin in the left hand, pinched on its edge between the thumb and fingers (this is where the vanish gets its name). The fingers of the hand are together, allowing no spaces between them and the backs of the fingers are towards the spectators (so the thumb is facing the magician). The right hand approaches the coin from the side. The right hand is held in a similar manner, with the fingers together and their backs facing the audience. 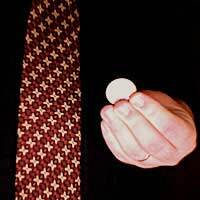 In one smooth move the magician covers the coin with his fingers as if to take it. Once the coin is gone from view, the left thumb loosens its grip on the coin, which is allowed to drop into the left hand. It should land nicely in a finger palm position. The right hand completes the move as if it held the coin. The magician drops his left hand to his side, forgotten, with the coin held in the finger palm position. The magician follows the right hand with his head and eyes, as if it actually held the coin. The audience will look where the magician looks, accepting his misdirection. At this point the magician can pretend to make the coin dissapear as he wishes - rubbing the fingers together as if rubbing the coin out of existence, tossing the hand up as if the coin will fly out, etc. When the hand is opened, one way or another, the coin has vanished. Making the coin re-appear is the next logical step, but may not be required depending on what you plan on doing with the pinch vanish. If it is part of a larger coin routine then you may have plans for that coin still in the left hand, in finger palm position. Reaching into a pocket to retrieve an item for the next trick is a way to get rid of the coin without making it re-appear, which is perfectly acceptable. One way to make the coin vanish and re-appear would be to make the vanish occur as the magician “tosses” it into the air and then clap the hands together to “catch” it on it’s way down. Thus it will appear to have been invisible for a moment. Practice actually taking the coin to observe how your arms and eyes behave, so that you may imitate that behaviour when actually performing the vanish.